Over the weekend we received the aftermath of Isaac in the form of heavy downpours. We really needed the rain around here so I'm not complaining, but it forced us to be inside a good part of the weekend when we desperately needed to get some work done in the garden. After the rain died down a bit on Saturday just before nightfall, I noticed the creeks were full of rushing water so I did what any normal person would do - pulled on my rainboots and splashed around. Of course I had my sidekick with me. There's something so fun about splashing down the creek. Just forgetting everything else and letting my inner kid come out and explore. No agenda, no time constraints (except for the decreasing daylight), just allowing myself stay a little while and enjoy nature. Our creek only fills up when there is heavy rain, so it is always a nice reward after being stuck inside all day to go out and play in the water. I am thankful for the rain and the boost it will give our garden. I love not watering for a couple days and still reaping a nice harvest! 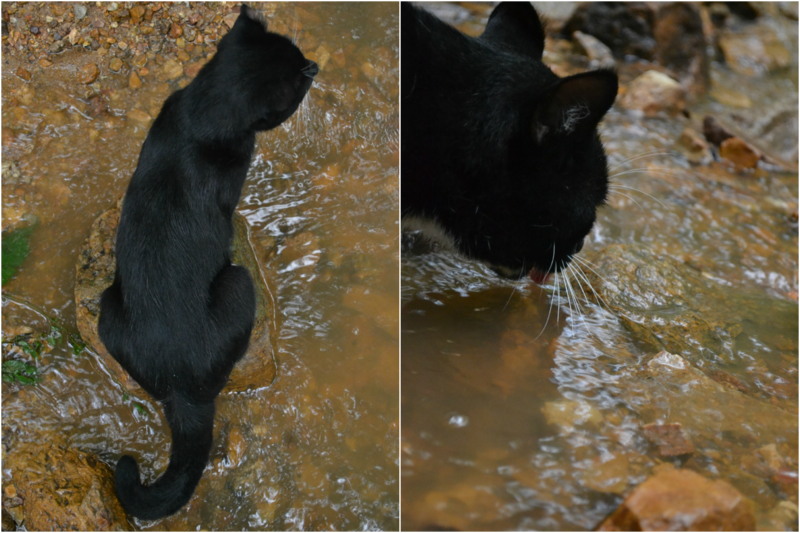 Great shot of your kitty sitting on a rock amidst the water! A perfect way to celebrate the end of the rain. Looks like your sidekick probably spent more time watching you splash around than actually getting wet. Lots of rain, indeed! We got drenched!